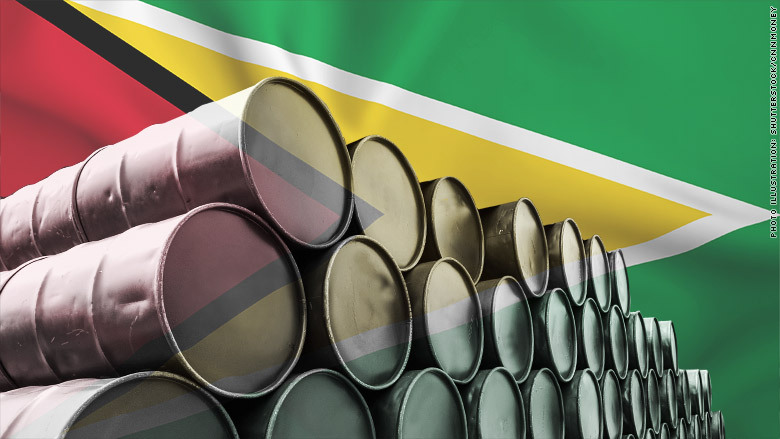 How will Guyana deal with its oil windfall? The South American country with the smallest GDP is about to burst with oil. ExxonMobil found oil off Guyana's coast in 2015, and believes the reserves are big. Conservative estimates project to about 4 billion barrels. Some experts think there's more to be found in the country's 6.6 million-acre Starbroek Block. But how Guyana prepares for the windfall from a newly discovered fossil fuel repository will have big ramifications for its future. For a country with a population of fewer than 800,000 and a GDP of slightly more than $6 billion, the discovery is life changing. "There's a realistic chance of this transforming the economy," said Pavel Molchanov, senior vice president and equity research associate at Raymond James. "It's particularly impactful for a small country like Guyana." When the first oil starts to flow, which ExxonMobil hopes will be in 2020, Guyana could reap billions almost immediately. By 2025, ExxonMobil wants to produce 750,000 barrels of oil per day. History contains numerous cautionary tales about countries that have squandered a sudden surge of riches. Venezuela struck oil centuries ago, but in 1998 the government of Hugo Chávez installed political loyalists into top jobs in the nationalized oil industry and began diverting the revenues into social programs. The country failed to reinvest into its oil infrastructure and when oil prices crashed, so did Venezuela's economy. Now, even basic goods like food and medicine have to be imported. Hyperinflation is soaring and the IMF predicts it'll hit a rate of 1,000,000% by the end of 2018. Equatorial Guinea's also squandered its oil windfall, but through wanton corruption. Between 2000 and 2013, the small West African nation brought in $45 billion of oil revenue. But it remained one of the poorest countries because the dictatorial government went on indulgent spending sprees in France. Corruption, infrastructure and unexpected market forces could present challenges for Guyana, too. The democratic republic comprises two political parties made up of descendants of African slaves on one side and descendants of Indian indentured servants on the other. The fear is that the government in power could unfairly favor its ethnic constituents. At the moment, the Afro-Guyanese party, the PNC, is running the government. But there's an election in 2020, which could decide who controls the purse strings. "I wouldn't discount civil unrest, even for such a small country," said Eileen Gavin, senior politics analyst at Verisk Maplecroft. Guyana should also be aware of "Dutch disease," a phenomenon in which existing industries are forgotten in favor of a new one. Guyana currently makes most of its revenue from exporting gold, bauxite, sugar and rice. Some countries have handled windfalls well, and not spent everything at once. Notably, Norway set up an "oil fund" for investing surplus revenues to benefit future generations. Most experts agree that Exxon's contract with Guyana is favorable toward the oil giant. The IMF recently advised the Guyanese government to revise the contract for future deals, stating that its tax laws are "well below what is observed internationally." But some say that a contract in Exxon's favor at this point is to be expected, given Guyana's lack of experience and infrastructure for the extraction. "Nothing had ever been found in Guyana before," said Ruaraidh Montgomery, senior analyst at Wood Mackenzie. "So, it's high risk in a frontier area. They needed to offer appealing fiscal terms to attract investors." And as the oil is tapped and more is found -- and the investment risks disappear -- Montgomery said Guyana, a "world-class hydrocarbon basin," would probably tighten its future contracts. For now, Guyana is doing everything right on paper in preparation, said Gavin. It's due to establish a sovereign wealth fund this year, and has joined the EITI, an organization that helps countries "manage hydrocarbon reserves in a fiscally responsible manner." But it's still too early to tell. "The proof of the pudding will be in 2020, when the revenue starts to flow," Gavin said. Correction: An earlier version of this article misstated when Venezuela discovered oil.